Animefringe: Reviews - WXIII: Patlabor The Movie 3 O.S.T. WXIII: Patlabor The Movie 3 O.S.T. Format: Audio CD / 46 min. Comments: Can't quite stand on its own. WXIII was a brilliant film. While many fans were disappointed in the extremely brief (albeit pivotal) appearance of the main characters from the manga and TV series, it was easily the best science fiction movie I've seen all year, and Pioneer's almost insanely comprehensive three-disc DVD version of the movie was a worthy package for the movie. While it was undeniably a sci-fi flick, it was first and foremost a mystery. It was focused on the actions of an investigator trying to locate the culprit of a number of Labor attacks that eventually started including humans as time progressed. If you've not experienced any incarnation of Patlabor before, then a short introduction is in order. In an era of anime series that featured giant robots as a gimmick to attract fans of (literally) heavy metal, Patlabor was a show with giant robots that featured the characters that piloted them, instead. It was a human drama that just happened to have heavy machinery, as opposed to a show with heavy machinery that happened to have human drama. In the near future the story posits, Labors are used for everything. Labors are giant mechs that humans pilot in order to perform sophisticated tasks with incredible power. Not long after the rise of the use of Labors did cases of Labor abuse begin to appear, and thus was formed the special team trained to pilot the Patlabor. It's an abbreviated word representing the full phrase, "Patrol Labor," and is essentially a group that investigates Labor-related crimes with specially equipped Labors of their own. While it's good to know that before watching the movie, you can easily get by without knowing anything about the world of Patlabor. And really, if I thought you could listen to this CD without knowing about the world of Patlabor, I wouldn't have explained it. However, knowing that the movie is a dark, dank, mystery sheds some light on the inspiration behind the music on the CD. In the context of the film, this soundtrack is perfect. For the most part, it's quiet, ominous, and slightly unnerving. In the movie, it enhanced the suspense to a whole new level. It was composed and conducted flawlessly, and its quality is undeniably high. However, on its own, without anything to latch it on to, I find the music to be a bit boring. It's not something I'd listen to while cutting the grass or driving. It's not something I'd find myself humming for weeks on end. It might make good background music (say if you're studying) and it'd make excellent music for a slideshow of nature pictures you took, but I doubt that was the creator's intent. No, this was made for the movie, and its place is in the movie. This is mood music, created to invoke certain emotions in viewers as they watch the movie. In any other context, while it may be aurally pleasing, it isn't all that fun to listen to. 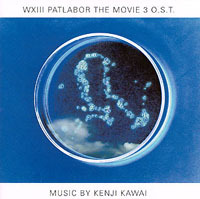 Unlike a John Williams score, such as Star Wars or Indiana Jones, which is exciting and fun even without a movie playing at the same time, the music from WXIII probably won't grab anyone except diehard Patlabor fans. It’s too bad diehard fans are split down the middle with half being outraged at the exclusion of the regular characters from the film and the other half enjoying it for what it was. The case is well-designed, with an appropriate amount of bioengineering graphical touches, a page-long note from composer Kenji Kawai, and a few images from the film. There are also stylistic additions that align well with the themes of the film, but won't mean much to people who haven't seen it. All of the liner notes (including credits) have been translated into readable (if not quite smooth) English, and at a significantly lower price point than the Japanese version (and lacking the import costs), this is a good value for English-speaking music fans. Get this CD if you're a film buff and you really enjoyed WXIII. There's a bit of the old Ludwig Van ("Sonata fur Klavier Nr. 8 Pathentique Adagio cantabile" for the curious) in here for fans of classical music, but it's hard to suggest this release to people who haven't seen the film. The soundtrack is entirely instrumental (with the exception of chanting, or background oohs and aahs occasionally), so I can't even say get this for the great single it features. On the other hand, it's extremely easy to recommend the film to everyone. Not only did it have amazing animation, staggering attention to detail, an excellent plot, and admirable voice acting, but the music in the environment of the movie was perfect. Again, just as Patlabor did in the past, WXIII takes science fiction elements and uses them merely as background material. The real drawing point of the movie is the human element, and within the film, few components highlight this focus better than the impeccable soundtrack. So, ultimately, my suggestion is to go out and get the film, no matter what. If you like the movie enough, then pick up the soundtrack too. I can't vouch for the soundtrack, but I guarantee the movie will have you enthralled in its rich plot and superb characters.